The cooling sensation and crisp flavor of peppermint tea may help freshen your breath, but it also provides many health benefits. Whether you make this tea from fresh peppermint from your garden or purchase mint tea from your local grocery store, this tea can help with a range of stomach and digestive issues, and it also has nutritional value. Check in with your doctor before taking this tea for any medicinal purposes. Peppermint tea does not provide much in the way of nutritional value. For each 5 oz. serving of tea, you add only 1 calorie to your meal plan. Most of the calories derive from carbohydrates: 0.4 grams of carbs per serving. You also take in 0.1 gram of protein and 0.1 gram of fat. Additions to your tea, such as honey, granulated sugar or cream, can increase the calorie value. As is, however, peppermint tea is very low in calories and fat, offering a healthy beverage choice for your diet. Drink peppermint tea to increase the antioxidant levels in your body. Evidence presented in the August 2006 edition of “Phytotherapy Research” notes that this tea is quite high in antioxidants. Antioxidants in this beverage help protect your skin and organs from free radical damage, which can have implications in how well your body fights off diseases such as cancer and heart disease. People with irritable bowel syndrome often experience painful abdominal cramps and frequent diarrhea, but peppermint tea may provide some relief. 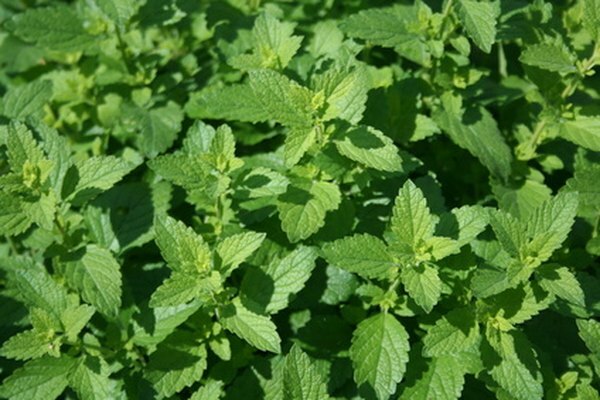 A study published in the June 2008 issue of the journal “Prescrire International” notes that peppermint oil and peppermint tea reduce the incidence of these symptoms as well as decreasing flatulence common to this ailment. Additionally, this tea has demonstrated no serious side effects. Consult your physician before drinking peppermint tea to help treat irritable bowel syndrome, though. A stomach ache can cause you misery, particularly if you eat something that doesn’t agree with you. You can drink peppermint tea, though, to ease stomach upset. The University of Maryland Medical Center website reports that peppermint triggers bile flow, an action that encourages the foods you eat to pass through your body more efficiently. This can be particularly useful if you consume high-fat foods as bile promotes the digestion of fat. Exercise caution when it comes to drinking peppermint tea if you have heartburn, gastroesophageal reflux disease or a hiatal hernia. The University of Maryland Medical Center website reports that this herb may loosen the band of muscle that connects the stomach to the esophagus, this action may allow stomach acid to reach the esophagus and cause a burning sensation. Consuming this tea may also worsen gallstones.